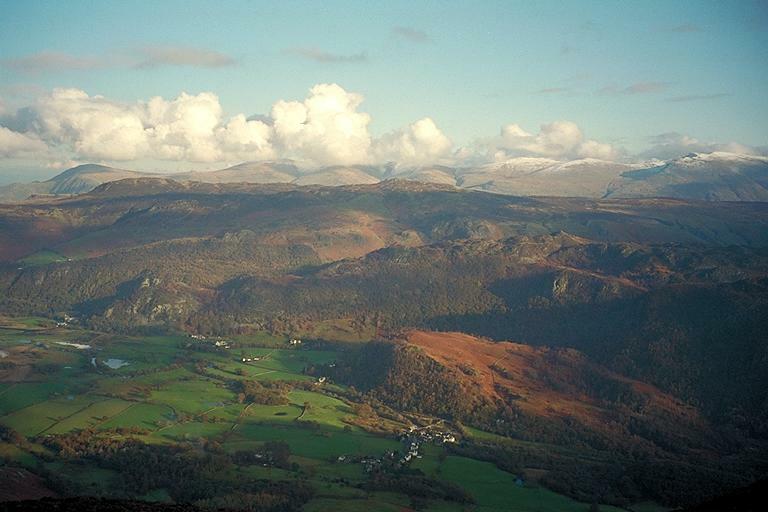 This picture is taken from a viewpoint above Blea Crag which is midway between Maiden Moor and High Spy. On the horizon from the left are: Clough Head and a wide gap before Great Dodd. Mill Gill separates it from Watson's Dodd and then Stannah Gill provides a cleft before Stybarrow Dodd. Sticks Gill runs down from Sticks Pass before snow-capped Raise appears, slightly hidden behind the slopes of Whiteside - Brund Gill lies in the valley between them. Helvellyn Gill provides a second diagonal cleft before Browncove Crags are seen with Helvellyn behind. Bleaberry Fell can be seen in front of the gap between Clough Head and Great Dodd; and at the southern end of that particular ridge, High Seat lies in front of Stannah Gill. The village of Grange lies down in the valley in the centre of the frame, overshadowed by Grange Crags. Beyond that tiny eminence is Brown Dodd, which hides the valley of Watendlath Gill behind it. The hamlet of Watendlath lies further up the valley, on a line with Helvellyn. Smaller version of this picture.